The garment industry of Combodia earns 80 percent of Cambodia’s foreign exchange earnings and employs an estimated 350,000 people in more than 300 factories. 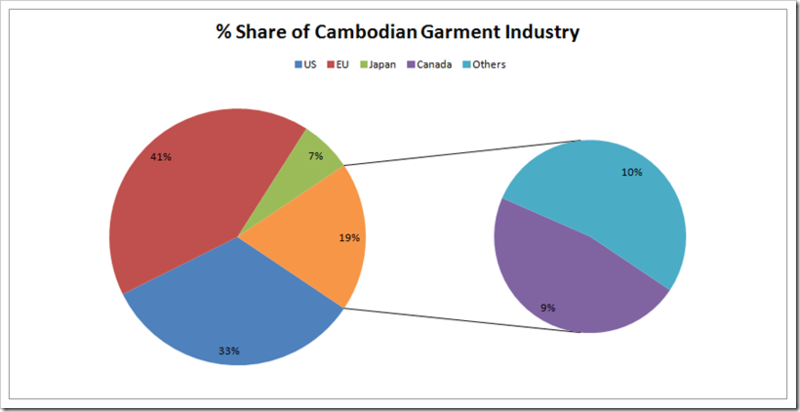 As companies which buy from Cambodia-like H&M, Inditex, Marks & Spencer, New Look, Adidas, Nike, Levi’s, Uniqlo-know very well, Cambodia benefits from preferential trade agreements with the European Union (EU), Japan, Canada, whereas China does not. Manufacturers in Cambodia benefit from duty-free access to the EU through the Union’s Generalized Scheme of Preferences (GSP) Everything But Arms (EBA) arrangement. 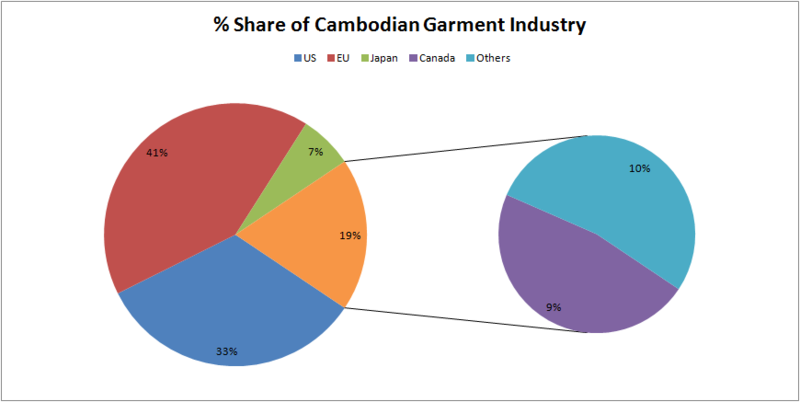 According to the Ken Loo, secretary general of the Garment Manufacturers’ Association in Cambodia (GMAC),Cambodian garment exports are only growing in markets with beneficial access, like Canada, Japan and especially the EU – its largest export market, accounting for 45% of the total, where imports have duty-free access under the generalized Scheme of Preferences (GSP) Everything But Arms (EBA) arrangement. According to figures release by the local Ministry of Commerce the total value of exports from the garments from Cambodia was USD 5.7 billion . The break up of the exports stands divided among various markets as follows with the major share being taken by EU. In this report, we did a detailed analysis of Denim Exports Of Men and Women Jeans To USA & EU during the period of 2011-2016 .